Making a great corned beef sandwich involves a labor of love and time. 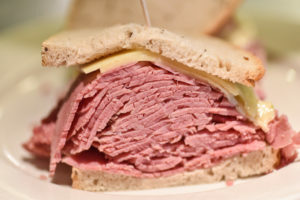 Corned beef, though probably Irish in origin, became a staple among the Jewish immigrants probably in the late 1800s. Corned beef, made from brisket, was very tasty and easier to obtain compared to fresh meats (and probably cheaper). Corned beef comes from the brisket of the cow. Brisket is naturally tough due to the tremendous amount of sinew and gristle. The pectoral muscles of the cow are huge chest muscles and is naturally very tough to chew. By the way, pastrami also comes from the brisket or from a similar cut to the brisket. There are two parts to a brisket, the “first cut” and the fat cap. This is important when choosing regular or “lean” corned beef for your sandwich. The initial step in preparing the best corned beef sandwich is “corn” or pickle the meat. Corning usually takes about 1-2 weeks, depending upon the vendor. Some vendors inject the brine solution into the meat to hasten the process. Corned beef is a salt-cured product using rock salt (aka corn). In addition, nitrates or nitrites are usually added which give corned beef the “pink” color of the meat. Other spices and sugar may be added. The corning also preserves the meat, an important attribute in the days before refrigeration. Once the steaming is completed, it’s time to slice for serving. Except for our hand cut sandwiches, we use a deli meet slicer to produce thin consistent cuts of meat. 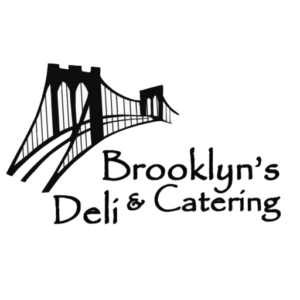 We try to make our slices no more than 1/8″ – thin slices are more tender and meat packs better between the bread making it easier to bite and chew. No matter how you choose to enjoy your corned beef, we pride ourselves in providing you with a taste, texture and melt-in-your mouth that rivals any Jewish deli.